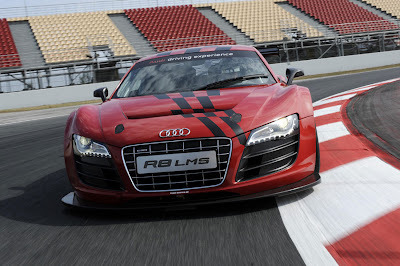 Want to drive an Audi R8 LMS? Audi launches "race experience"
As if the various events in the "Audi sportscar experience" were not enough, Audi has just raised the bar with "race experience." Offering Audi customers the rare opportunity to not only drive the Audi R8 LMS race car, but actually participate in a race with a professional Audi ‘factory’ drivers. Full details after the jump. The Audi driving experience is expanding its portfolio by offering an opportunity that is unique in the world: effective immediately, Audi customers with sporting ambitions can book exclusive racing commitments with the Audi R8 LMS. Audi is making its Le Mans-winning team available for this purpose. The Audi R8 LMS that has been specifically developed for use in customer sport and was the GT3 car to be beaten last year right in its first racing season provides the base for the new Audi race experience. In addition, as many as 120 customers had the opportunity of an active driving experience with the 386-kW mid-engine sports car at the end of October 2009 during the Audi sportscar experience. The Audi race experience now marks the next stage. It offers customers the opportunity to contest races with the Audi R8 LMS themselves – on request even together with professional race drivers. The vehicles will be prepared and fielded by one of the world’s most successful sports car teams: the squad of Reinhold Joest that has won the famous 24 Hours of Le Mans as many as six times for Audi and that will again compete in the French endurance classic on June 12/13 with the latest-specification Audi R15 TDI. The Audi race experience team Joest is planning a total of six races for the 2010 season, fielding two cars each as part of the “Langstreckenmeisterschaft” (VLN) on the Nürburgring-Nordschleife, starting with the race on April 24. In addition, there are plans for events with the Audi R8 LMS on race tracks and at the Groß Dölln driver training facility at which the customers will be trained and can also obtain the required racing license.